Old world style built in custom library is made of solid cypress with heavy distress and a dark stain and glaze. countertops are sustainable, durable, solid bamboo. 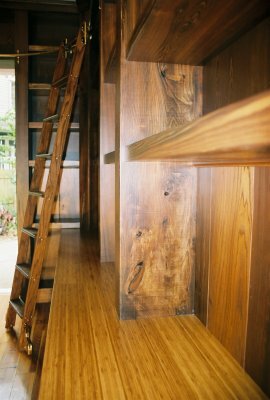 The Putnam rolling ladder shows signs of real age and use, it was bought used from a store fixtures dealer, it was salvage from a shoe store.